Dan’s Bourbon of the Week: Stagg Jr.
It’s been a rough week over here at Baseball and Bourbon: I had my wisdom teeth out. I won’t embellish, it didn’t go as poorly – or painfully – as some people had warned me. But it wasn’t exactly fun either. Most saddening was the fact that I was advised not to drink bourbon while my jaw recovered. The one saving grace was that it gave me the perfect excuse to rest and watch the NCAA tournament all weekend. So with a congrats to the Dayton Flyers, as well as Michigan and Michigan State, this week’s review is of a new favorite of mine. Now, I have no been lucky enough yet to get my hands (and taste buds) on a pour of George T. Stagg, try as I may. I’ve been able to hunt down glasses, if not bottles, of almost all of the other Buffalo Trace Antique Collection, but the GTS eludes me. That said, I was fortunate enough, when in Kentucky, to get my hands on a bottle of Stagg Jr, the newer offering from the BTAC. Aged 8-9 years (unlike the 15+ GTS is bottled at), but coming from the exact same mash bill, ‘unfiltered’ and ‘uncut,’ it pours at a barrel strength. My bottle shows a 136.6 proof, or 68.3% alcohol. Potent. What I really note about the Stagg Jr was how my opinion changed over three months, and three different tastings. 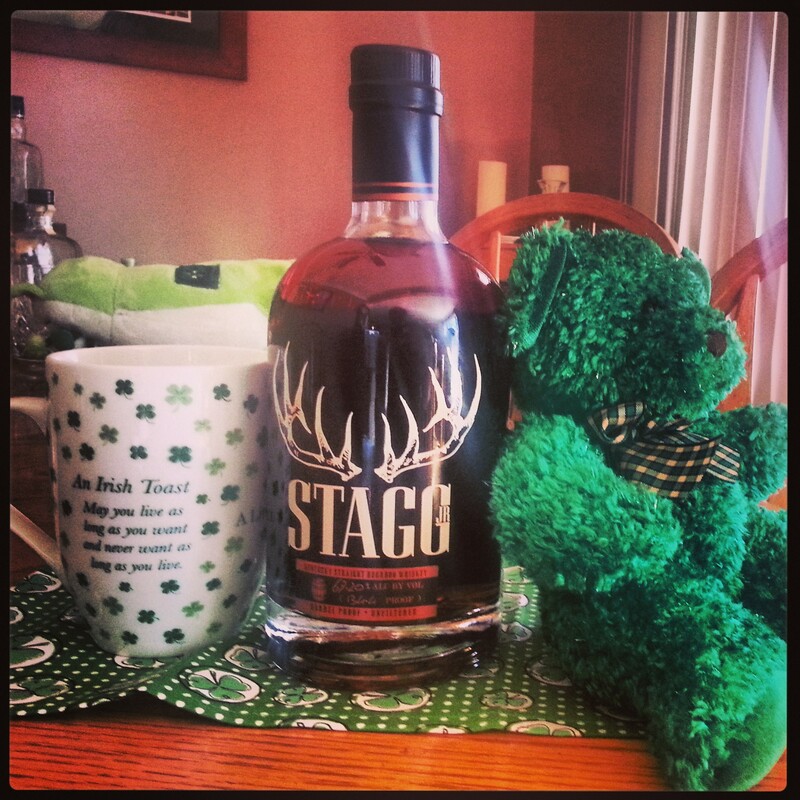 I first had the Stagg Jr. in December at a bourbon event at the Wine Garden in St. Clair Shores. There I found it too brash and even harsh. Two months later I tried it again at a local whiskey bar, and found that I enjoyed it much more, and found it much more complex. Last week, for review purposes, I tried it again, and came to trust my second, rather than first impression. The nose: Make no mistake, like any barrel proof, that first sniff will be a burn. Give it a minute to breathe, and you will note a burned-sugar-toffee, vanilla, charred oak and some spiciness. The sweet notes – vanilla and toffee – strengthen as it site, too. The taste: Again, let’s not kid – that barrel proof is a kicker. It has a thicker mouth taste than I expected, but I could taste very strong influence of charred oak and rye spiciness. A hint of brown sugar, but the sweetness gave way to the spicier hints of cinnamon, pepper and oak. It didn’t knock me back, but I found it smoother than anticipated, without ice. The finish: It has a burn, a good solid one. Notes of spice hold out along with the taste of wood and subtle sugar sweetness. A little dry, as though there were tannins, on the throat. My take: Personally, I like Stagg Jr. Looking around online, it seems the biggest drawback Stagg Jr has is not being George T Stagg. Maybe I will feel that way when I’ve had the GTS, but for now, I find this to be a nice, strong drink.